Two elaborate, cast iron printing presses of the beginning of 19th century. A true copy of the Gutenberg printing press. Showcases for printing techniques such as lithography, offset lithography, wood engraving, copper engraving and silk screen printing. An exhibition of the Braille Writing Method. Two large flatbed printing presses. Rare Greek and foreign publications . Call the attraction if you want to visit during the week. EURO 2 for 65+ years. EURO 1 for students and unemployed. Free for under 15 years of age. How popular is Museum Of Typography? People normally club together Ancient Aptera and Chania Archaeological Museum while planning their visit to Museum Of Typography. Best museum ever. They still have centuries old typographers and you can still use them! And take home the print you did! Finally a museum where the artifacts aren’t buried behind a glass coffin. And the guide is passionate and friendly. Definitely worth the trip. I wish all museums were like that. A place with a moving story, that lives to this day thanks to passionate people who care about typography and want to share it's history and growth with others. We came on a Friday afternoon and had a very warm welcome by a lady with dark brown hair and smiling eyes. She is an educator and journalist who works at the press, whose owners own the museum (I think our guide's name name is Alia but not sure if im spelling it right.) She's very knowledgeable and gave us an informative tour of the museum. She is only there on Fridays so be sure to go on a Friday for a intimate chat. 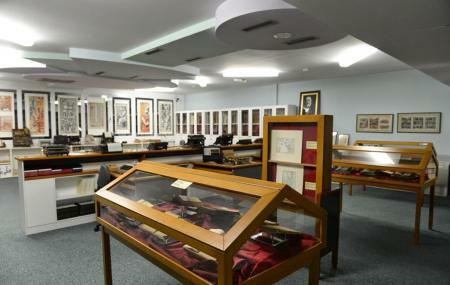 The museum is much larger than imagined, spanning two floors with two separate areas, containing equipment and artefacts on typography, printmaking and even bookbinding. We spent a leisurely 2 hours in the museum going through the exhibits. Some were interactive- we experienced printing manually which was fun! The two house dogs are so loving and welcoming. Ticket price of 4 euros was well worth it, despite the location (bit further from town) taxi from town centre to the museum is about 13 euros. Thanks for having us! Highly recommend to visit!!! A very insightful experience, staff was very helpful and did a great job taking us around the museum! Must see for typography lovers! Wow! We visited the museum today with our 9-year-old daughter and were amazed by the plethora of exhibits and the wonderful assistance explaining everything to us. A really modern museum with great exhibits. The museum is really a great tip for families with kids, because it has interactive elements and some engaged guides that explain the history and importance of typography. It also includes some wonderful pieces of art around the theme of typography, writing and printing. A really well designed museum, especially for kids. The main docent was clearly very passionate about the work and gave a very detailed description of each piece. This museum would be a great place to take kids especially, because there is an interactive component (you get to print using copies of several hundred year old printing presses!). The museum is also much larger than it seems at first, but the second floor is probably the most interesting so don't skip it!